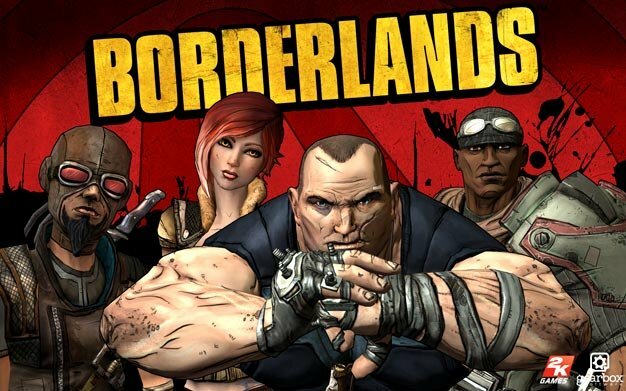 Borderlands is definitely influenced by Fallout 3 and Diablo. You have desolate wastelands that are pretty detailed in that way current-gen titles can do it, and it’s presented to you in the first person with a gun sticking out of the corner, but you also have the basic, more fast-paced and infectiously addictive gameplay that involves killing and looting to get stronger and cooler stuff. It’s a potent combination, and one that surely would spell success, only it didn’t quite work out for Hellgate: London. One could only hope for the best from this new attempt. Rest easy, though, because if you’re looking for some good fun killing and looting, and have a couple friends, this could offer a good many hours of fun. The setup is pretty basic. You play one of four Vault Hunters. A Vault Hunter goes to the planet of Pandora to find a mythical treasure that was left by aliens. Most the people you encounter don’t believe in it, but seem willing to help you out anyway because you’re willing to kill people they don’t like… which is mainly because they pay you. That’s really all you need to know. There are some other mysteries like a ghostly guide lady, and some who to trust/distrust characters, but it doesn’t really matter. The story’s pretty thin, and ends without much satisfaction. Overall, it’s just a platform on which Gearbox presents their stylized world, and on which you do all your killing and looting. Bandits abound, and so they’re everywhere to shoot. Bandits have bosses that you take on once you’re strong enough, and some other bosses too that are generally some kind of Gauntlet you run or an endurance of several high-powered regular enemies and one (the boss) with lots of health. If you’re playing coop (as you should (more later)), then you’ll probably clear this pretty fast anyway to get to what’s important: killing and looting. The stylized world really is noteworthy, especially when considering how close Pandora was to looking completely generic. What Gearbox did was take the feel and look of the increasingly-popular scene, and give a lively twist with nearly cartoon-like visuals. The goal was to give the whole game a hand-drawn feel, and to that end I think it’s a great success. Everything is cohesive and feels like it came from the same place. Nothing exemplifies it better than the Claptrap robots that help you throughout the game. They’re awkward looking, but seem to have accepted their odd design and go and be goofy anyway. While they stick out, though, there’s little else that has too much pop or wow factor. The most noteworthy thing is that it all just comes together as well as it does. A dilapidated town looks like it barely has some civic function, and it’s right next to a cave that probably causes some problems, and it all fits well. If only they were able to get everything to stream in ala Fallout 3, rather than have little gateways to other areas, leading to loading screens. And that killing and looting… well that’s what you’re going to stick around for. The whole formula here is competently reflecting the one laid down by Diablo from years ago. You pick your character, you enter the game world, and you kill to get stronger stats and items. That’s it. It’s really simple, but really effective. The characters each have affinities for certain types of guns, but that doesn’t seem to discourage any crossover usage at all. I played as a Hunter, who tends to like sniper rifles and pistols, but it didn’t stop me from getting some rocking proficiency with a shotgun, which is normally the Soldier’s territory. The main distinguisher is their unique special skill, and their skill trees. My Hunter had a pet bird named Bloodwing who could fly toward a single enemy and deal a good chunk of damage. The soldier can set up a turret, the Berserker can er… go Berserk and punch people silly, and the Siren can make a ghost version of herself that can move at great speeds and then reveal herself with a nifty ranged shock. The skill trees are also unique, and actually do give a little incentive to stick with a character’s weapon preference. One of the Hunter’s trees, for example, focused squarely on perks of Sniping. Increasing the size of my clips, my accuracy, little boosts after landing critical hits (head shots) with a sniper rifle, etc. Bloodwing had a tree as well, and, of course, a gunslinger tree. These skills will benefit you in battle, but they never really felt like they had quite as large a hand in my increasing strength as getting new weapons and items. And oh those guns and mods. You will be able to do almost anything you can imagine (provided you’re not TOO imaginative). Want a sniper rifle that shoots bullets that set people on fire? There’s a gun for that. Want a revolver that spreads corrosive acid all over a baddie? There’s a gun for that. I even met a guy who fired his shotgun at teammates to recover lost health and shields. The variety is pretty vast, and factor in the smaller details, like clip size, rate of fire, accuracy, and you start to see the value in the game’s procedurally generated weapon and item system. When the ads says there are a bajillion guns, it’s no exaggeration. This kind of variety even goes into grenades and even your shields, where you can find some that let off a burst of fire when they deplete. This is also how the game maintains a level of satisfaction in playing it for hours on end. There’s nothing like finding a brand new gun with which to deal newer and bigger heaps of damage. This is especially true with shotguns and revolvers that dismember arms and obliterate heads. There are also vehicles. You drive around in them, and sometimes shoot with them, and there’s even one boss fight that requires a vehicle. Besides that, though, they’re not that important. And so, this paragraph is short. 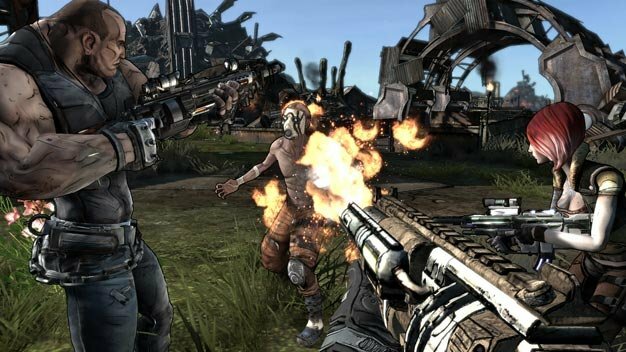 You can’t discuss Borderlands without acknowledging the co-op around which it was designed. Another big game that even its developers like to compare it to is Fallout 3. Where that game differs, though, is that it’s single-player, and really drives home the feeling that you’re a lone figure in a massive world that functions with or without you. The loneliness is by design. 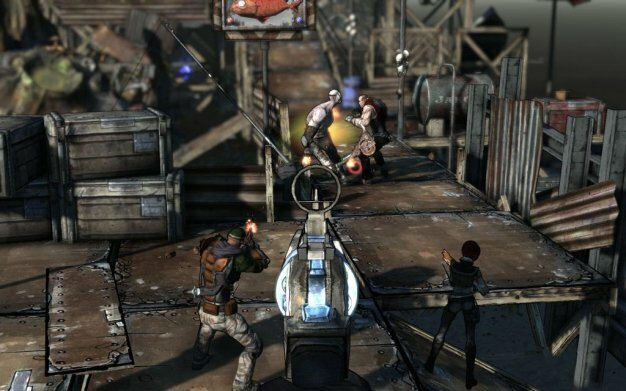 Here, playing single-player is a far weaker experience than with some co-op companions. It’s still a pretty fun game on your own, but since this isn’t one massive, creepy landscape like Fallout, and since the focus is more on raw action than anything, there’s no excuse to buy this game and not play with someone, even if it’s obnoxious internet strangers. The satisfaction of rocking a new gun is just amplified when combined with the probably-awesome guns some of your buddies will whip out. It also adds a little motivation to keep exploring the lands, hoping you’ll stumble on a similar gun yourself. In case you’re curious if the co-op is good, it’s my opinion that it is. For a little more motivation: you level and progress faster, and if you get a full four player game going, enemies get stronger, and thus produce better loot, increasing the chances of getting cool guns. Just be sure and grab it before a teammate does. There are two things absolutely crucial to get me to recommend this game to someone. They need to like killing and looting, but killing more so. They also need to like co-op gaming. Not quite as crucial, but still useful, is having three friends with a common schedule, because then you can be reasonable about looting habits. In my public adventures, though, I did stumble on some considerate mercenaries who’d point out some goods I might like. Good times. The visuals are also really fun to experience, but don’t let that get you to thinking it’s tied to a compelling story that unfolds before you. Most story comes to you in the form of text-based quest logs, and even then there isn’t much. But again… killing and looting is the name of the game in Borderlands. If you like to put time into beefing up a character and rocket launchers that can electrocute people, then this may be for you. Just don’t go it alone.